A dashboard is a single screen showing the status of an application. At a glance you should see what’s going well and what areas are struggling. 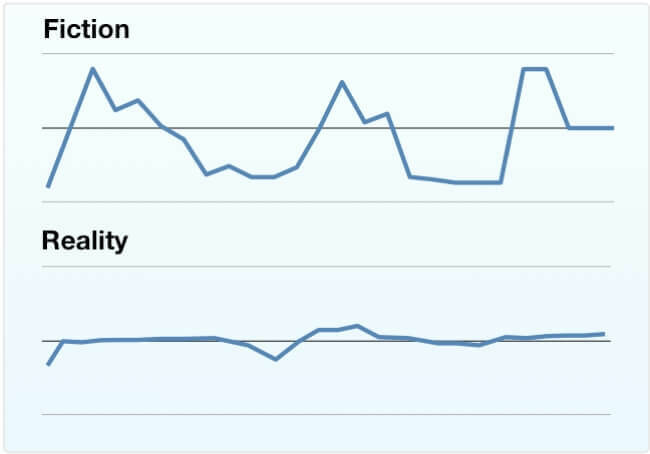 Customer retention is down. Sales are up. Complaints are at an all time high. They’re the application equivalent of homepages, and present many of the same political challenges. Every department wants their pixels. I’ve designed many such dashboards, enough to prepare a talk summarising my findings. This talk was presented at UX Midwest 2011, MIX 2011, and a few other events. Here is my slidedeck, it’s a big one. There are many points put forward in the slide deck, the biggest lesson I can offer is iteration. You can sit with managers, CTOs, CIOs all day long watching how they work, but you’ll only learn what really happens when you present them with a screen and see what they do next. Some will reach for a calculator to work out the percentage change day to day. Some will open an Excel sheet to compare it with a previous year. 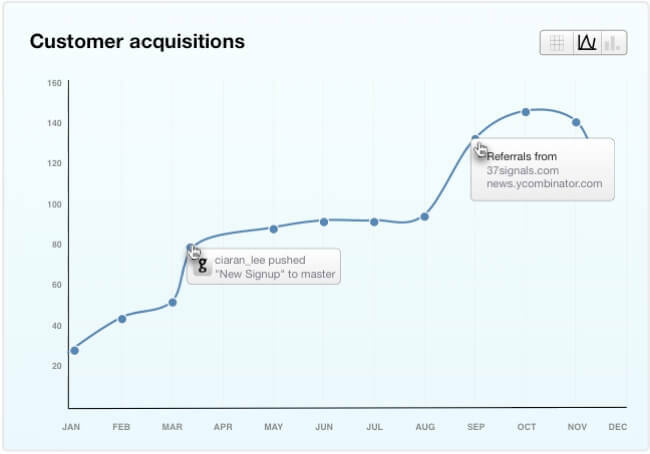 Iteration and user feedback is valuable in all areas of design, but none more so than dashboards. “I want todays figures” turns into “I want today vs yesterday” which turns into “I want growth or decline per day“, and before you know it you’re offering Daily/Weekly/Monthly growth and acceleration. To paraphrase Courtney Love, when they get what they want, they’ll never want it again. Every figure presented will result in another question being asked. The winning apps are those that answer questions users barely got around to asking. A good way to end up with a crap dashboard is to assume that every day is “off the charts”. Always design with real content, in this case real content means real data. You have to know what regular data looks like, before you can design normal or extranormal states. There are occasions where it makes sense to use additional visuals to make a point with more emotion than a simple bar chart. You can gain a lot when you sacrifice precision for persuasion. The key idea here is to get the right data (e.g. 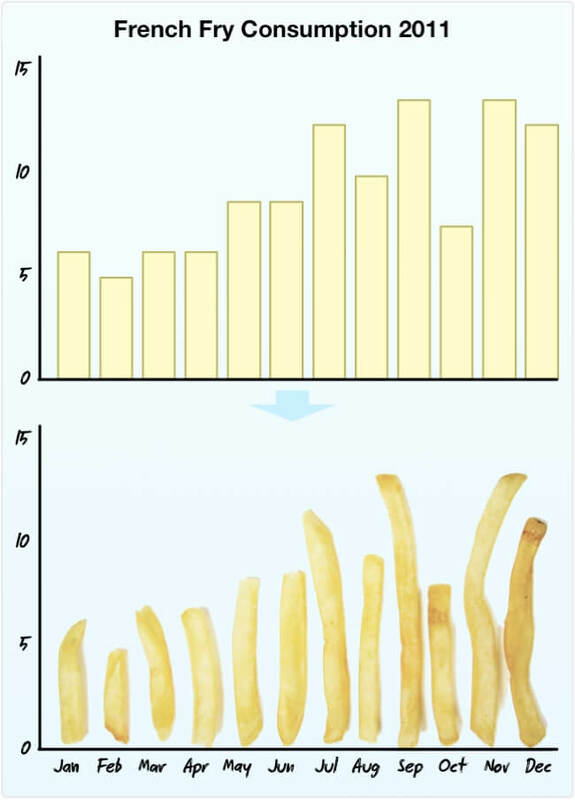 french fry consumption per month) to make your point, then get the data in the right form (bar chart) so it can be understood. When you’ve got that bit right, you can then spice up a boring bar chart using visuals appropriate to the domain. Designing With Data by Brian Suda. Dashboard Design & Now You See It, by Stephen Few. Various articles by Stephen Few at Perceptual Edge. The Wall Street Journal Guide to Information Graphics by Dona M. Wong. Beyond Tellerand – a conference I’ll be speaking about Data Visualisation at, in Dusseldorf, Germany.